Until very recently, people didn’t get across on boat, so I would ferry them in my rowboat, which was called The Red Baron, which was not the name I gave it. My dad named it. A dream: Ada is out in a rowboat without a life jacket heading into the big lake. It is starting to rain. Her hair is short like mine was when I first got my rowboat. I am worried about lightning. She is heading into the big lake even though I’ve called her in. Throughout the month, Radio Boredcast is making selections of themed music that fit the As Slow As Possible subject, either in an obvious or more ethereal way. Bells, Bowls, Gongs and Gamelan is a collection of just that - but from west and east and across genres and time zones. Stories are just words. And words are just letters. And letters are just different kinds of marks. So long as the words keep coming nothing will have changed, there are the old words out again. Utter, there’s nothing else, utter, void yourself of them, here as always, nothing else. But they are failing, true, that’s the change, they are failing, that’s bad, bad. it's in heaven, alit in heaven. Thwack! Thwack! and some birds. Lots and lots of bells. Very clichéd sounding. Pretty quiet stuff, interrupted by excited shouting. Recorded outside his bedroom, through the curtain. Better than track one because it has some faint singing being played through distant loudspeakers. nice stuff, very quiet, but very nice! Don’t be put off by this rote and obvious title. 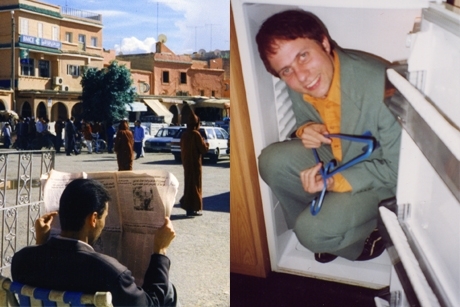 Instead, be loosely transported from west to east – Morocco to Thailand - via sound, music and radio transmissions recorded between the years 1997 & 2010 in the aforementioned locations. Porest – aka Mark Gergis is a composer, performer, producer and international audio/visual archivist. Under the name Porest, he has released several solo and group efforts incorporating multi-layered music, pop songs, audio collage, field recordings, and surrealistic radio dramas. Gergis was a co-founder of the experimental Bay Area music and performance collective Mono Pause (1993 -2004) and its offshoot Neung Phak, which performs inspired renditions of music from Southeast Asia. Samples from Craig Dworkin's UbuWeb paper “Unheard Music,” featuring John Cage, Steve Reich, Mieko Shiomi, Yves Klein, and more. As DJ /rupture, Jace Clayton has released several critically acclaimed albums and mix CDs, starting with 2001′s influential & groundbreaking live mix CD, Gold Teeth Thief, which earned a 4-star review in VIBE. Clayton maintains a busy international schedule performing in clubs around the world as well as venues such as The Whitney Museum, MoMA’s PS1, The Apollo Theater, the Pitchfork Festival and Spain’s SONAR. His recent album, Uproot, was named one of the 10 Best Albums of 2008 by Pitchfork. He maintains a blog, Mudd Up!, and hosts a weekly radio show on WFMU, which is re-broadcast on several European stations. A radio play without a script by Felix Kubin. "Mother in the Fridge" is based on a phone conversation between my mother and me. I recorded this call spontaneously in order to take revenge on the many words that I am carrying around with me. Most people who take a call from my mother don't get away with a talk under 40 minutes. That's why this radio play has a duration of 40 minutes. The remaining music of the one hour show contains improvisations by Fritz Ostermayer and me while preparing for a lecture on the Austrian anarchist Herbert Müller-Guttenbrunn in November 2010. (Felix Kubin, Hamburg, December 2011). ‘Stakeout’ explores the suspension of time inherent to the stakeout in the world of cops as per its depiction in crime fiction and the movies. The narrative moves between two locales: Phoenix, Arizona, in an abstraction from James Sallis’s The Killer Is Dying, and Bridgend-(Wales)-masquerading-as-New-York where Gwilly reprises the role of detective Henry Zubradski that he played in the Tony Gage movies Deep Cop and Deep Cop2: Too Deep A Cop (both 1993). I’ve always held that slowing things down was one of the fundamental tactics in experimental music (in fact, in my book, Handmade Electronic Music – The Art of Hardware Hacking, I pompously enshrine “Slow it down, a lot” as the “third law of the avant-garde.) It’s a weakness of mine, and one that I’m sure has cost me many a grant – an old friend of mine, having served on an arts council panel that had just turned me down, admitted, “Nic, you don’t make ‘panel-friendly music’ – it takes too long to get going.” My formative years were spent immersed in “minimalist” music under the tutelage of Alvin Lucier. I’ve always thought the first act of music making was careful listening – I just don’t listen fast. After La Monte Young, Glass’s “Music In 12 Parts”, and a lot of Cage’s music my offerings strike me as pretty middle of the curve, but I guess others think otherwise. A self-stabilizing feedback network creates an “architectural raga” out of site-specific room resonance. In this December 1962 program from the KPFA archives, composers Ramón Sender and Robert Moran (then graduate students in composition at Mills College), talk with Will Ogdon and John Whiting of the KPFA staff. Also present was dancer Judith Wickware who had worked with Anne Halprin. The two composers discuss the role of aleatoric, or chance music, in their work. All about the wonderful world of editing and cutting up of sounds. Ergo and Vicki talk about their favourite editors of life, and demonstrate how one can mess up sound so easily and to such good effect. Features the work of William Burroughs, Negativland, Language Removal Services and cut ups of BBC Radio. MSSBH began life as a turgid short story, written in an attempt to prove that a certain brand of screenwriting software was actually crap. It was, and so was the story, which no one would read, regardless of the amount offered. This new presentation, however, is bound to be the smash hit on radio I have always wanted. A little known fact about this piece is that it is entirely composed of birdsong, painstakingly recorded and edited, stretched, squeezed, modified, and modulated to sound like "synthesizers," "drums" and even "a narrator." Even more amazing is that it consists only of the songs of common sparrows found outside my window when I am feeling melancholy. Perhaps the most startling, amazing, and downright awesome wicked aspect is that encoded in between the birdsong are secret subliminal instructions which, if all goes according to plan, will mobilize a good quarter of the listening audience (+/- 12% standard deviation) into my zombie apocalypse army. WHICH YOU CANNOT STOP.